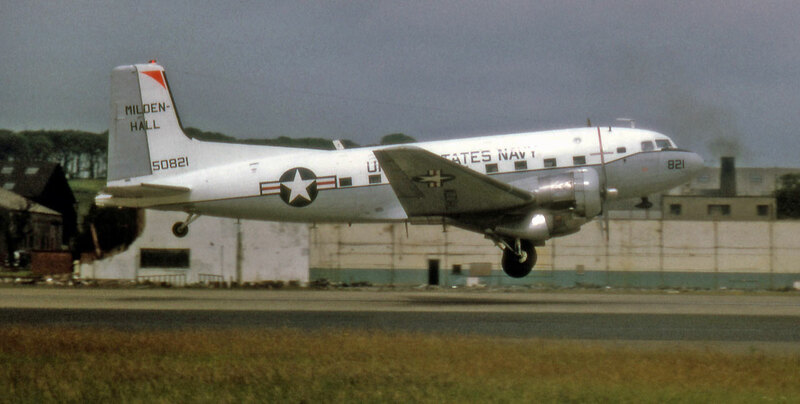 Here are some of Ken Marshall's USAF/USN images, most taken at Prestwick. Sometimes shot in adverse weather conditions - the luck of a spotter at EGPK! Rain gear is usually essential. 53-0270 Boeing C-97G Stratofreighter (17052) USAF - MAC - Minnesota Air National Guard. A simpler time, even as late as 1969, fences were like this. 53-0270 Boeing C-97G Stratofreighter (17052) USAF - MAC - Minnesota Air National Guard. 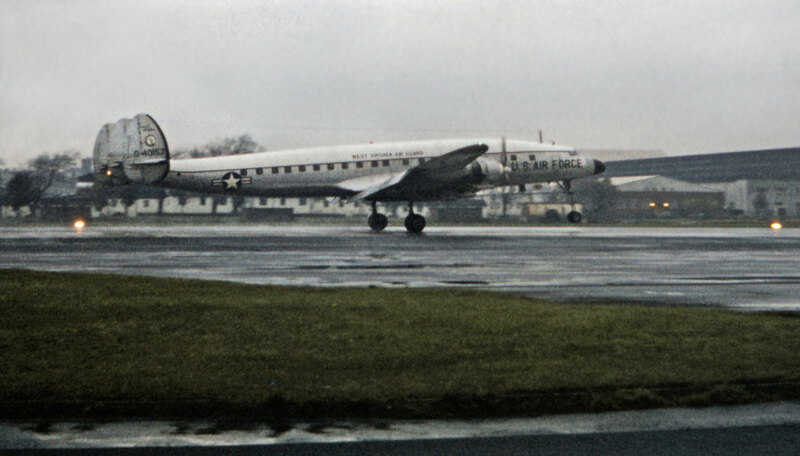 Visiting Prestwick on 23 February 1969. The above images show just one arrival and departure that might otherwise have gone unrecorded for us to enjoy today. Thanks Ken! Remember no long lenses back then! 52-2607 Boeing C-97G Stratofreighter USAF - Pennsylvania ANG. 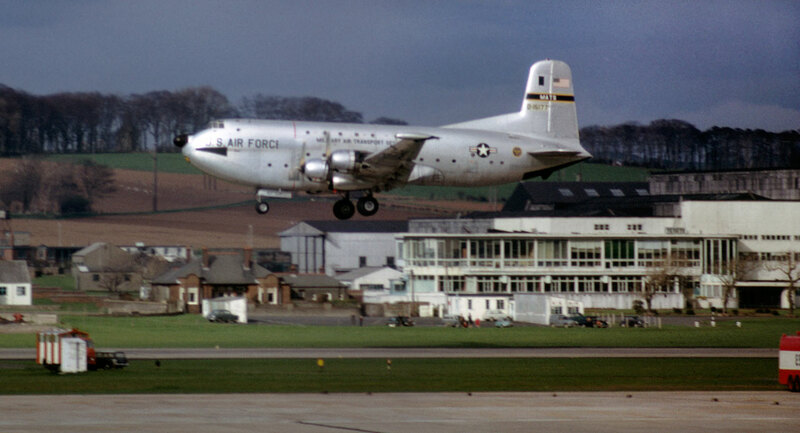 March 1967 at Prestwick. Note "shadow" of old serial presentation. 52-2759 Boeing C-97G Stratofreighter (16790) USAF - Utah ANG. 24 April 1967 at Prestwick. 52-2732 Boeing C-97G Stratofreighter (16763) USAF - Delaware ANG. 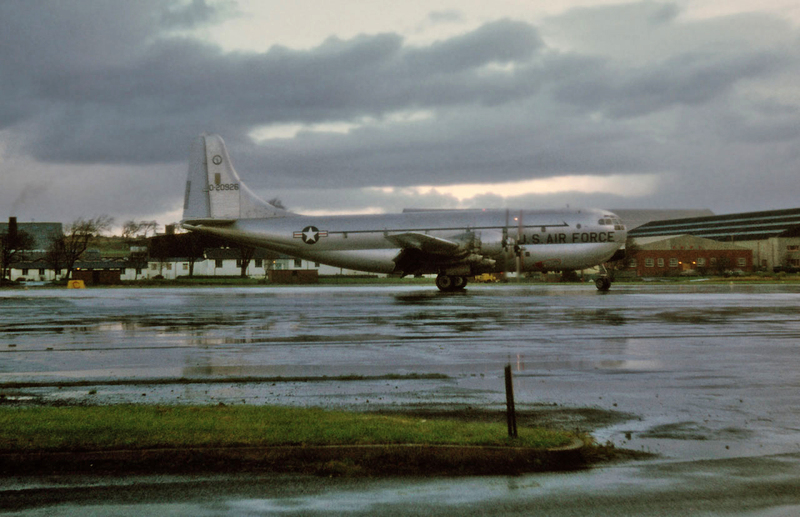 Prestwick, September 1965. 52-0926 Boeing C-97G Stratofreighter (16617) USAF does a nice tight 180 in front of Ken, after landing. 24 November 1968 at Prestwick. 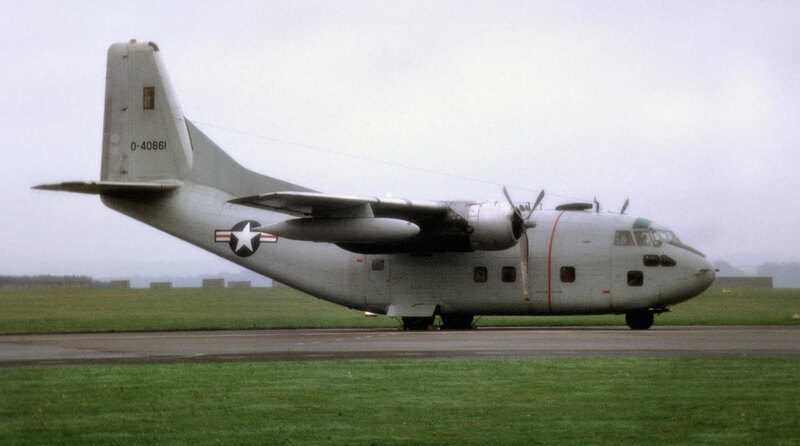 54-0141 Douglas C-133A Cargomaster (44711) USAF 436th arrives on 29 June 1968. Ken must have made the long hike "up the back" to the MAC terminal for the last shot. 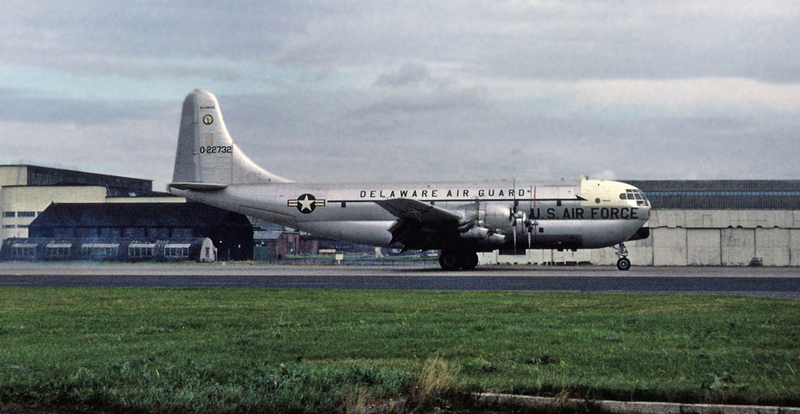 54-0157 Lockheed C-121C-LO Super Constellation (4176) USAF - West Virginia Air Guard arrives on 27 October 1969. As you can see, we often had to brave typical Scottish weather for the cause! Went to civil registry as N4115Q. 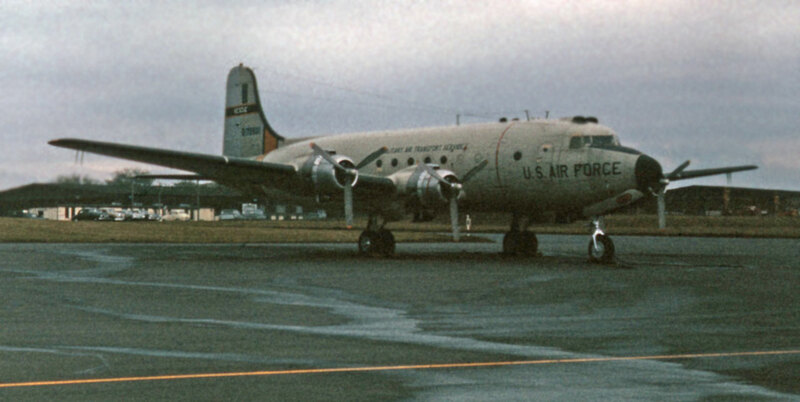 Later to Australia as VH-EAG, which was the registration of a L1049C-55-81 (c/n 4539) later modified to a L1049E-01-55, delivered originally to Qantas April 15, 1955, named 'Southern Constellation' and retired on May 03, 1963 and broken up in Burbank by Airmotive. 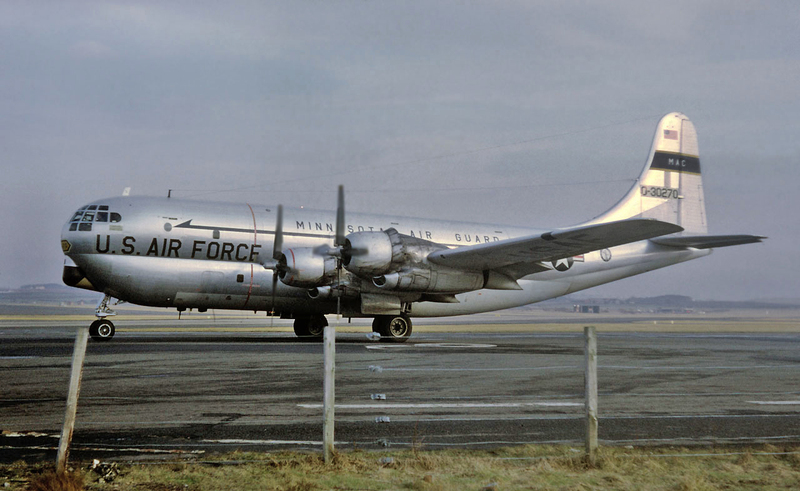 The C-121C as VH-EAG (2) is now operated by Historical Aircraft Restoration Society of Australia and wears a color scheme reminiscent of QANTAS. I had the great pleasure of sitting inside with all four engines running for over an hour at the HARS facility at Albion Park, NSW., on 05 November 2010. 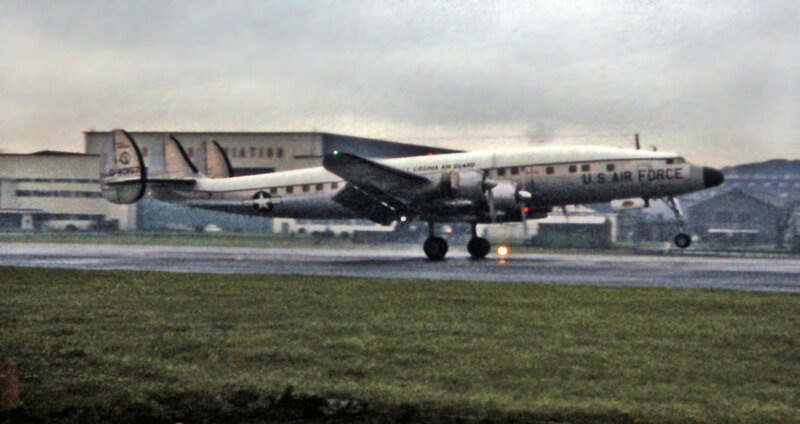 The previous time I had seen it was on 10 June 1964 at Prestwick, forty-six years earlier! 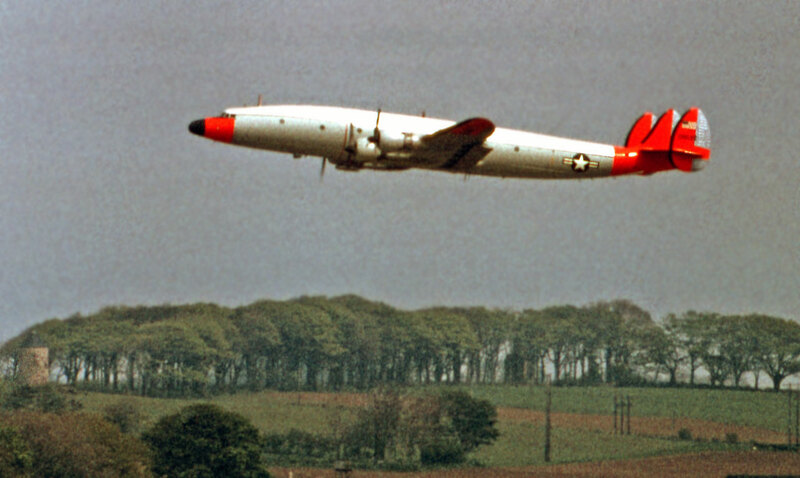 131635 Lockheed R7V-1 / C-121J Constellation (4136) USN, in the fantastic days of "high-viz", departing Prestwick in June 1965. 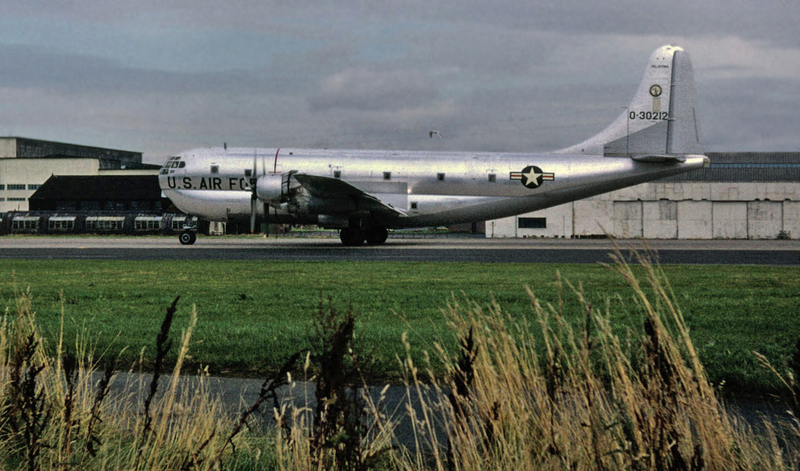 48-0617 Lockheed VC-121C-LO Constellation (749-2609) USAF lands at Prestwick in September 1965. 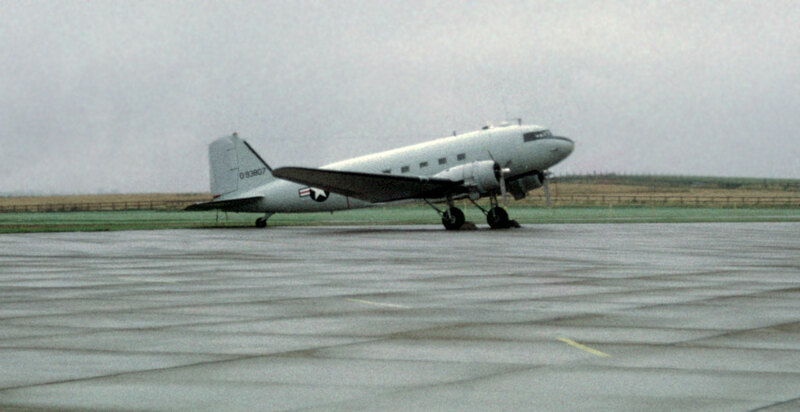 Later became C-GXKS. 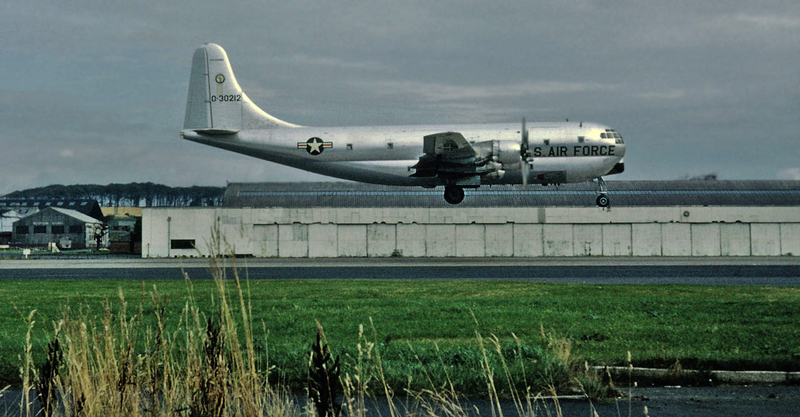 54-4058 Lockheed TC-121C-LO Super Constellation (4129) USAF West Virginia Air Guard, getting cleaned up as she departs Prestwick in September 1965. Ex 131628. 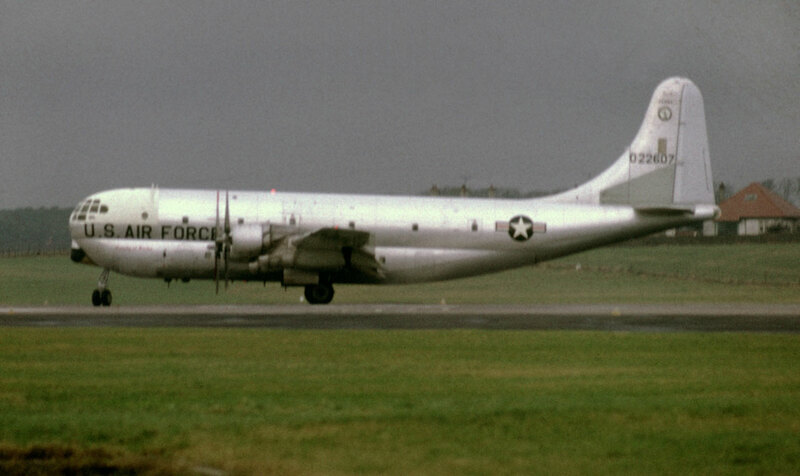 Lockheed EC-121K Warning Star at Lossiemouth in September 1966. 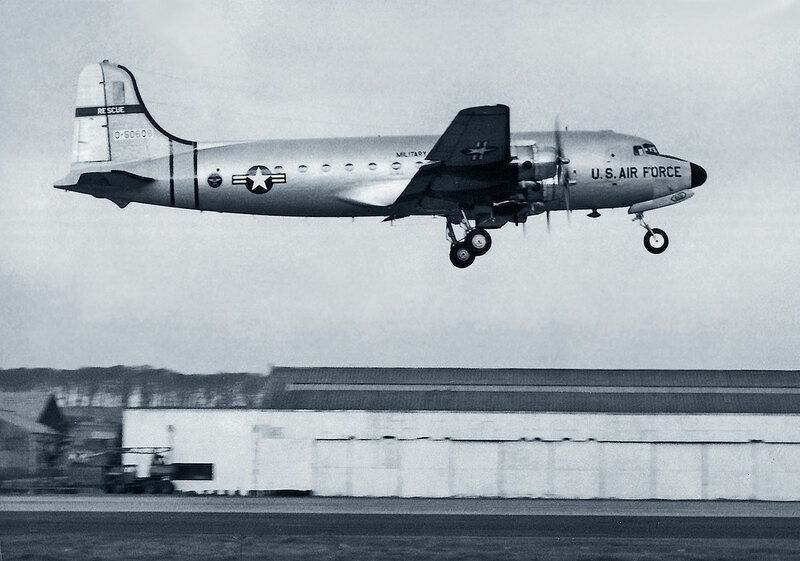 141328 Lockheed EC-121R / WV-2 Warning Star (4452) USN departing Prestwick, June 1966. Later became 67-21478. 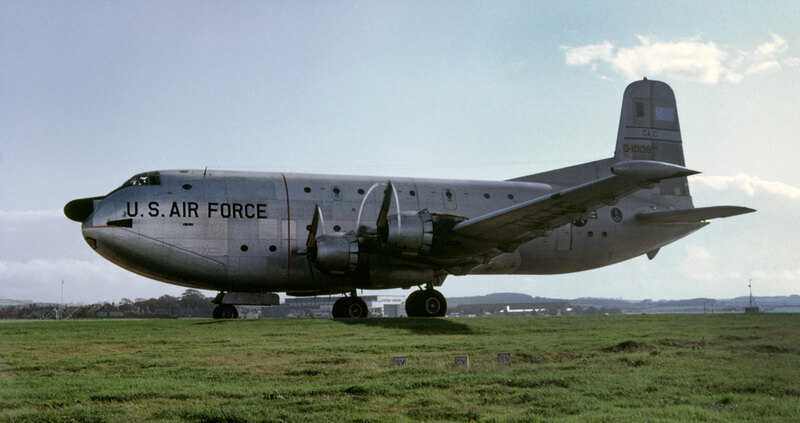 51-5177 Douglas C-124C Globemaster (43587) USAF - MATS. 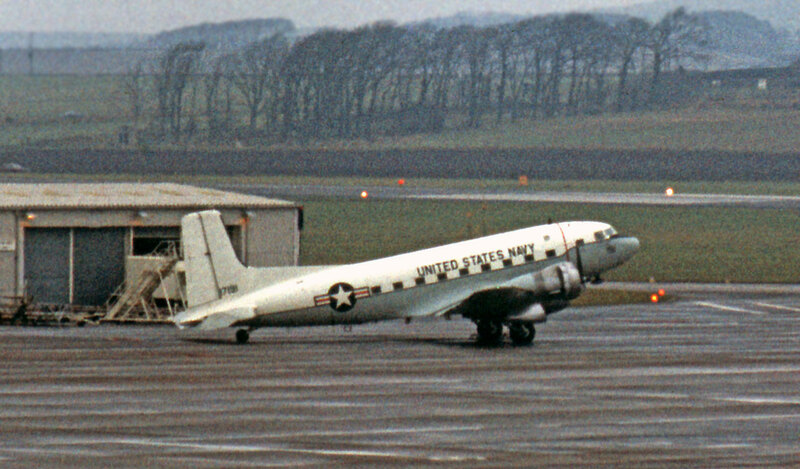 Prestwick in April 1965. 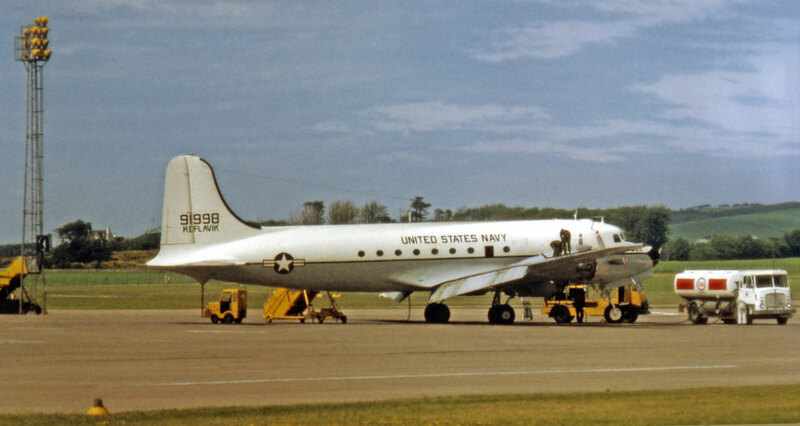 Retired to MASDC 02 May 1969. 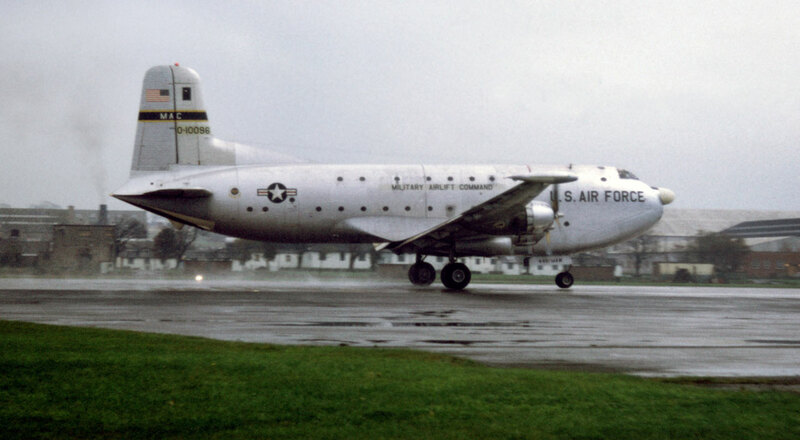 51-0138 Douglas C-124C Globemaster (43472) USAF - CAC. 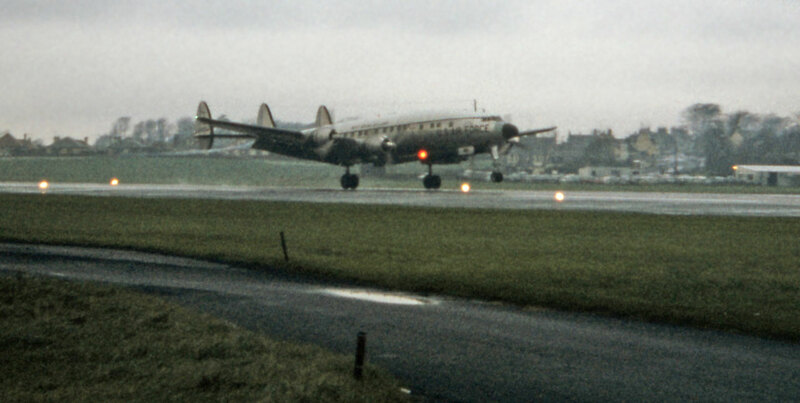 Approaching the holding point at Prestwick on 29 September 1967. Retired to MASDC 25 March 1971. 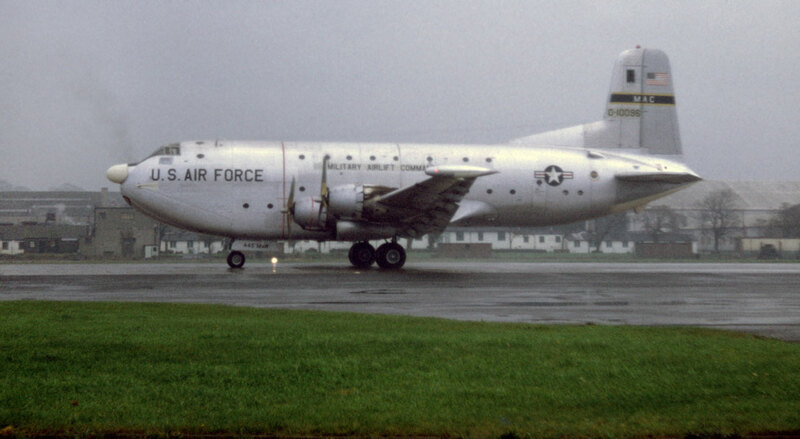 51-0170 Douglas C-124C-DL Globemaster (43504) USAF-AFRES in 1971. 53-0018 Douglas C-124C Globemaster (44313) USAF - North Carolina ANG. Prestwick 15 May 1968. I have included a few images just to give you a "feel" of what we got up to back in the 1960's. 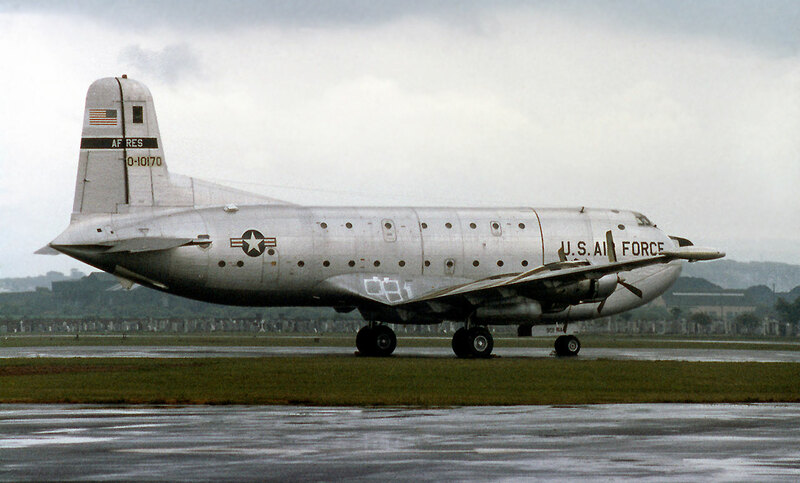 51-5177 Douglas C-124C Globemaster (43587) USAF. 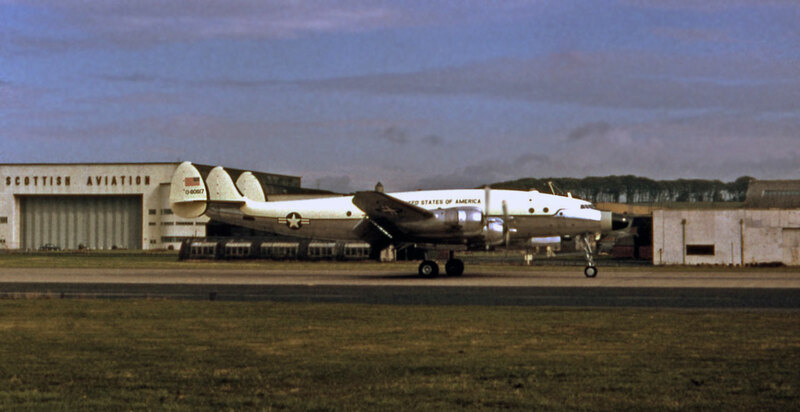 Prestwick in May of 1965. 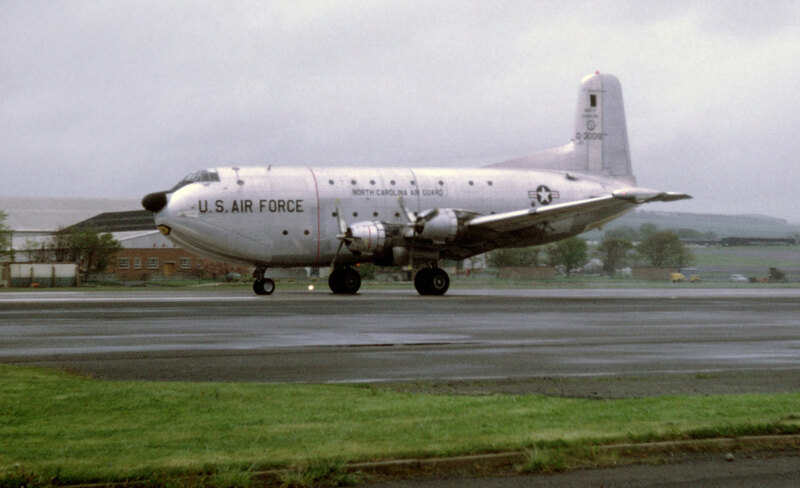 51-0096 Douglas C-124C Globemaster (43430) USAF - MAC 445 MAW visits Prestwick in November 1968. To MASDC 22 December 1970. 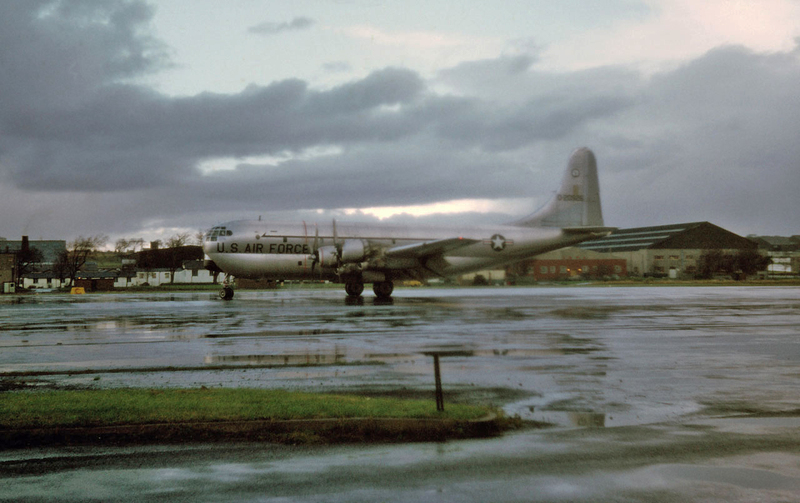 51-5190 Douglas C-124C Globemaster (43601) USAF - MAC at the new terminal on the south side, in March 1967. To MASDC 28 June 1969. 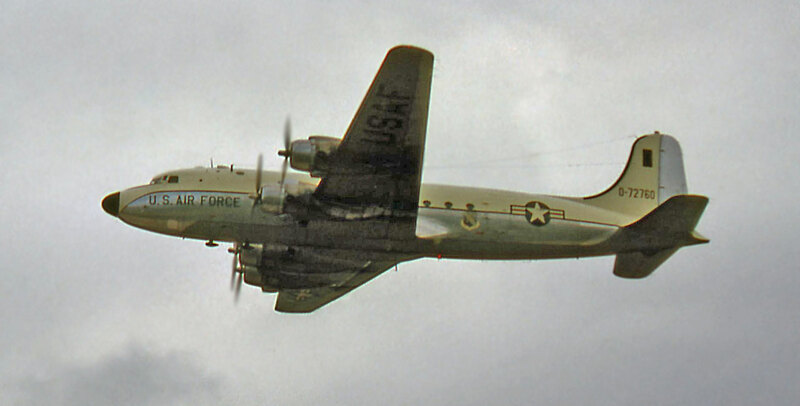 52-0940 Douglas C-124C Globemaster (43849) USAF - MAC on the north side, 19 July 1966. Note the coal tailings "bings" taken away in later years. 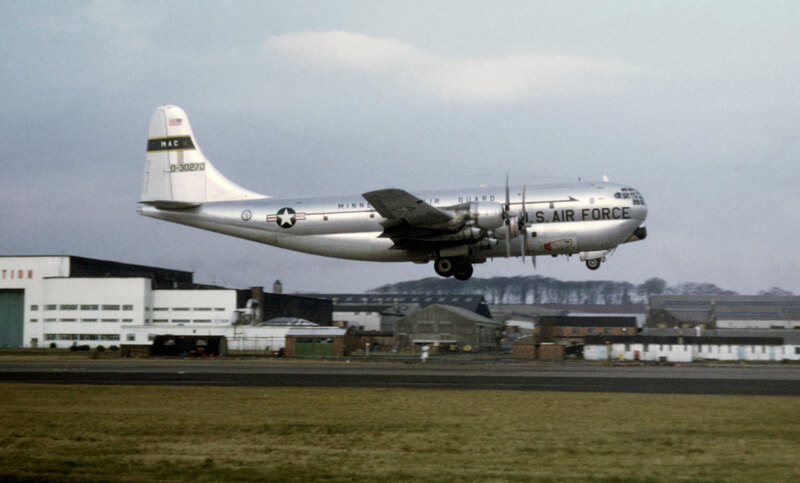 53-0008 Douglas C-124C Globemaster (44303) USAF - MAC departs Prestwick in December 1966. 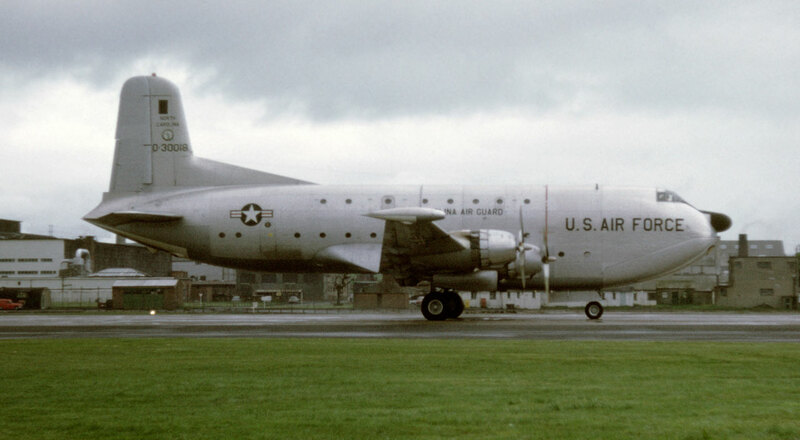 51-0167 Douglas C-124C Globemaster (43501) USAF - MAC. Prestwick 31 July 1966. DBR March AFB 06 June 1971. 51-0177 Douglas C-124C Globemaster (43511) USAF 10 December 1967 with 66-7948 Lockheed C-141A Starlifter (300-6240) USAF - MAC. The old and the new. 67-0008 Lockheed C-141A Starlifter (300-6259) USAF - MAC 438 MAW. 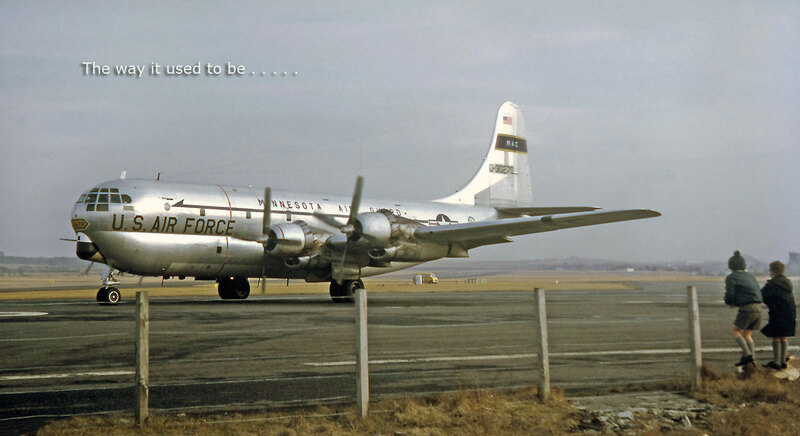 Prestwick 09 June 1968. w/o 28 August 1976. 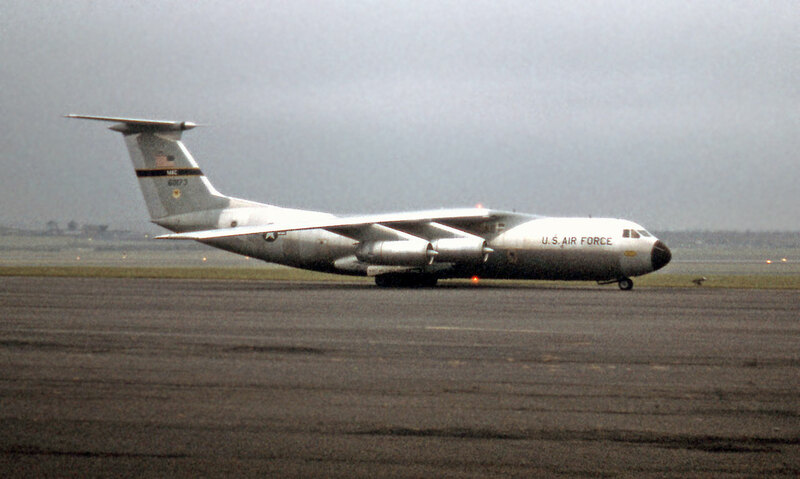 66-0173 Lockheed C-141A Starlifter (300-6199) USAF - MAC. Prestwick 21 January 1968. Struck on ramp 23 March 1994 at Pope AFB by out-of-control F-16D 88-0171 and burned. Of approximately 500 troops in the vicinity, 23 were killed and over 80 were injured. 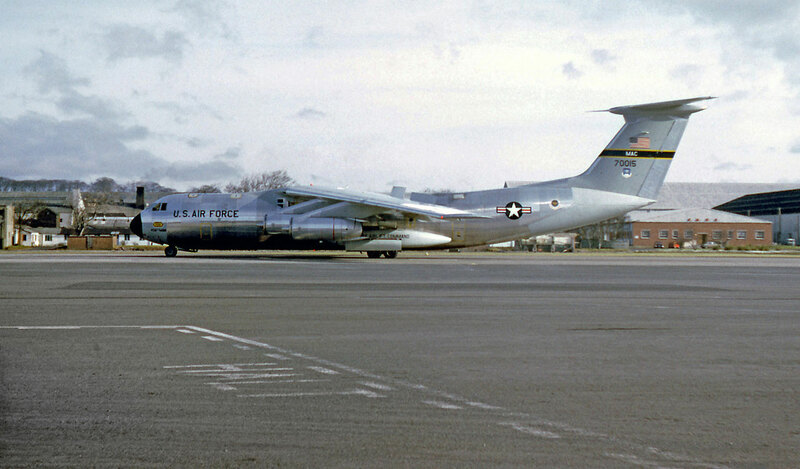 67-0015 Lockheed C-141A Starlifter (300-6266) USAF - MAC 438 MAW. Prestwick 10 March 1968. To AMARC as CR0185 03 October 2003. Still on AMARC inventory Jan 15, 2008. 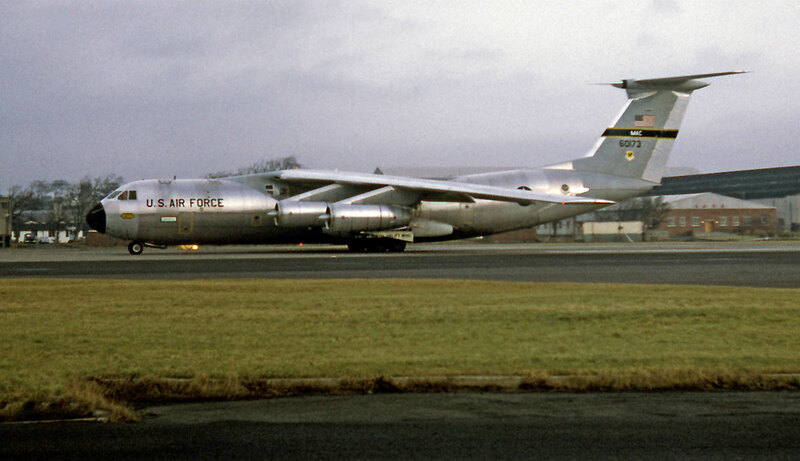 66-7948 Lockheed C-141A Starlifter (300-6240) USAF - MAC. Prestwick 11 February 1968. This aircraft graces the top banner of this section also. 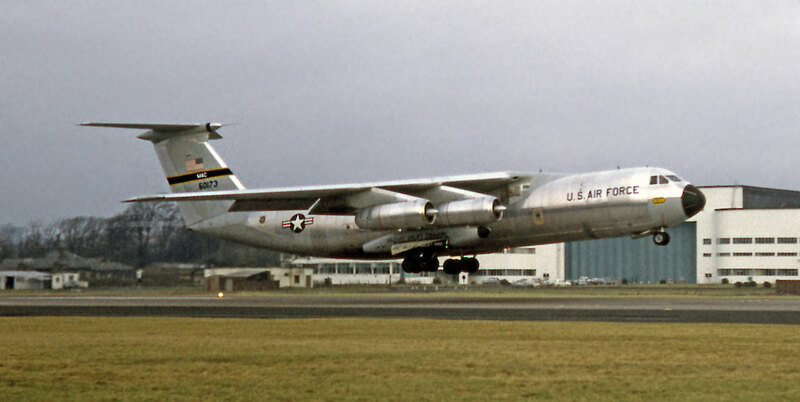 64-0610 Lockheed C-141A Starlifter (300-6023) USAF - MAC. Prestwick 18 July 1968. Retired to AMARC 15 March 1999. 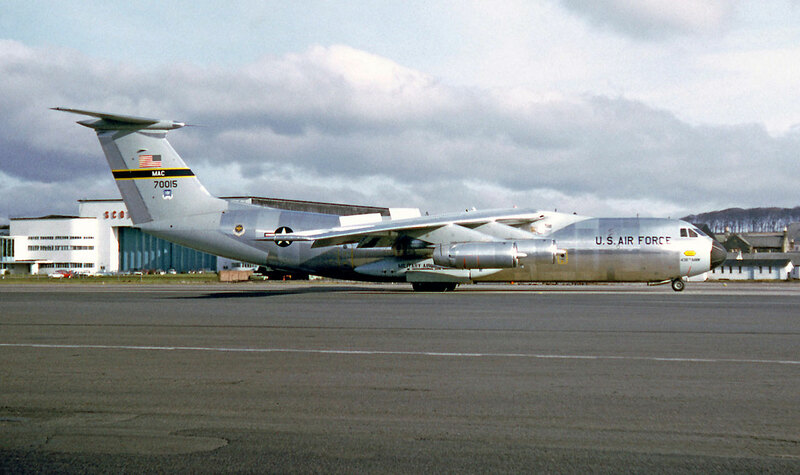 64-0614 Lockheed C-141A Starlifter (300-6027) USAF - MAC. Prestwick 17 August 1969. Retired to AMARC 28 January 2004. 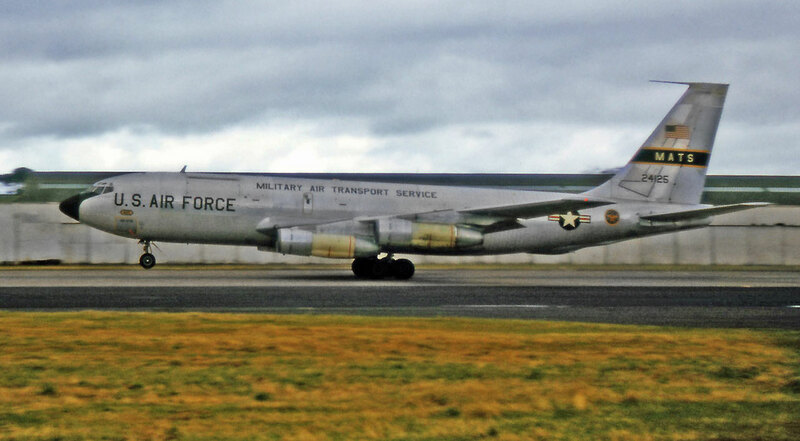 62-4125 Boeing C-135B-BN Stratolifter (18465) USAF - MATS departing on 01 August 1964. 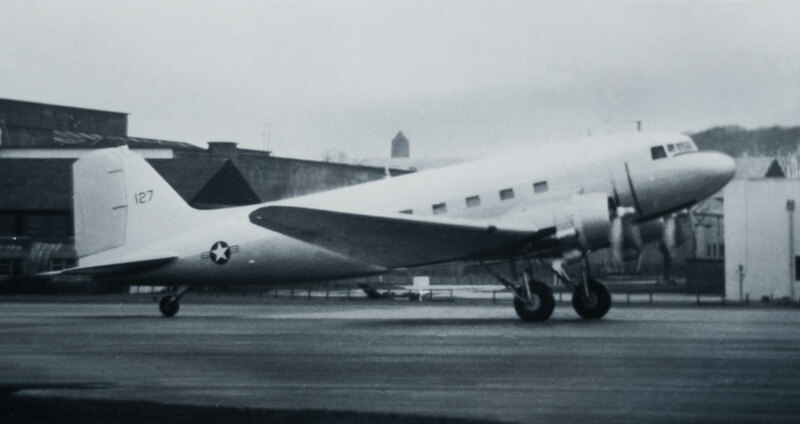 This aircraft was converted to VC-135B. 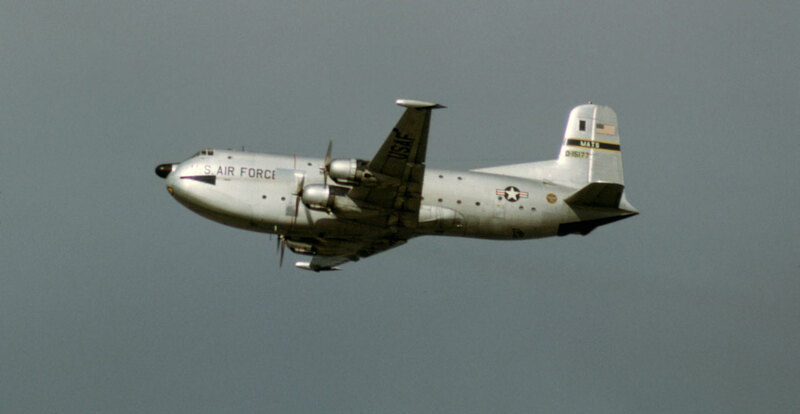 Reverted to C-135B. Modified to MDS RC-135W 'Rivet Joint" electronic intelligence aircraft. Still active in 2014. 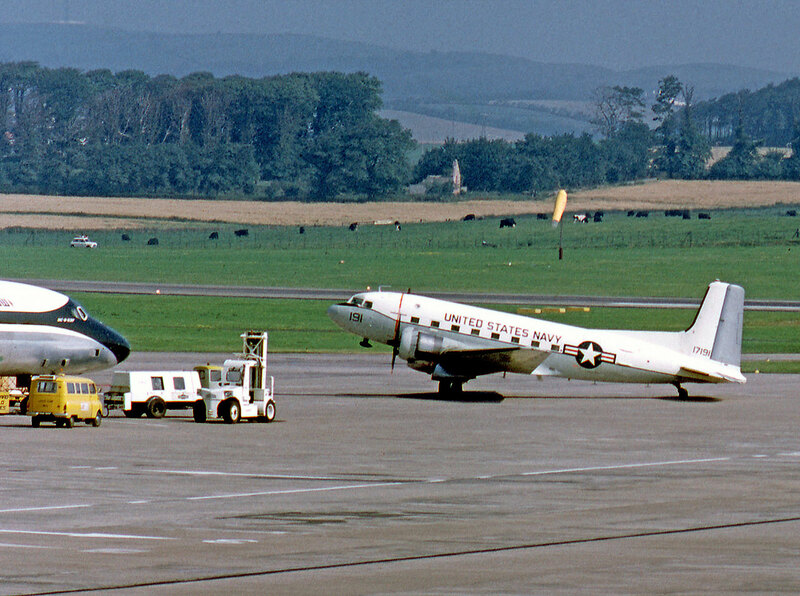 52-5806 Convair MC-131A Samaritan (53-26) USAF at Stuttgart, Germany, 19 July 1968. Later became 5806 of USCG. 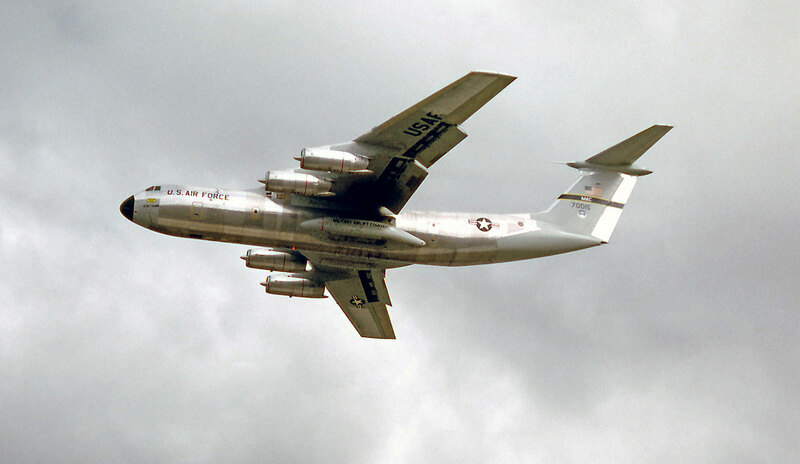 52-5787 Convair MC-131A Samaritan (53-7) USAF visits on 03 August 1970. 141009 Convair VC-131F / R4Y-1 (292) U.S.N. 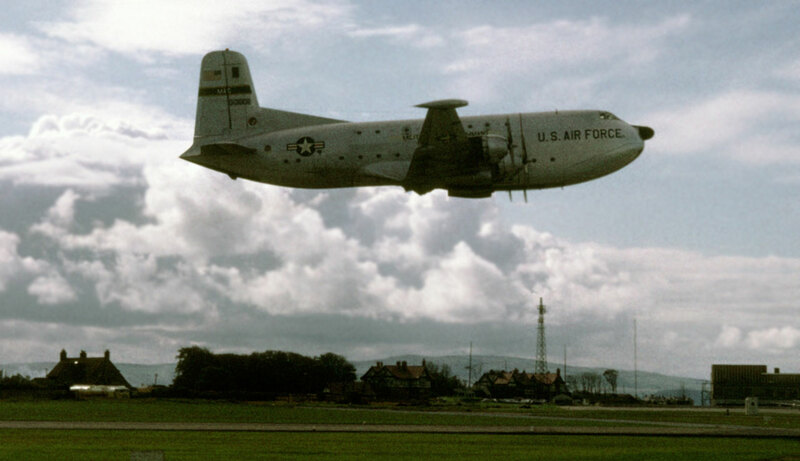 Based at Mildenhall. Notice the background, how much that has changed since this 26 July 1978 visit. 51-17661 Douglas C-118A Liftmaster (43723) USAF MATS getting the gear up in November 1966. Ex BuNo 131620 - later to South Korea as 17661. 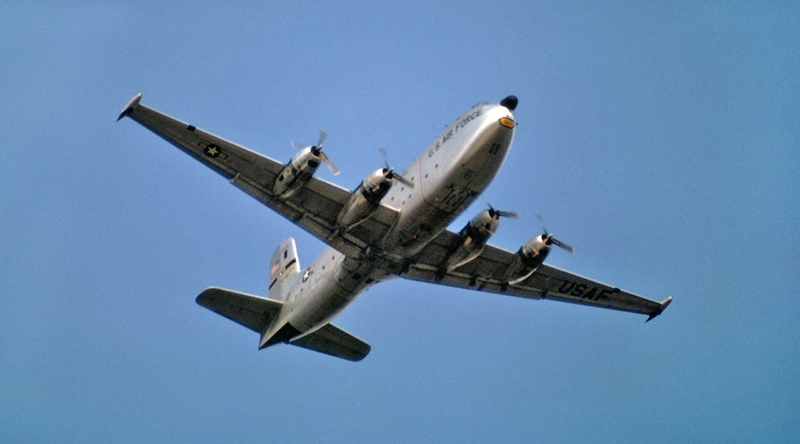 53-3269 Douglas MC-118A Liftmaster (44640) USAF - MAC, on departure 12 May 1968. Became N202GB. 53-3244 Douglas MC-118A Liftmaster (44615) USAF - MAC, July 1966. Became N3434F, then N33VX (TACA Internacional). Crashed at Golden Meadow, LA., after fuel shortage 20 July 1988. 51-3835 Douglas VC-118A Liftmaster (43582) USAF. 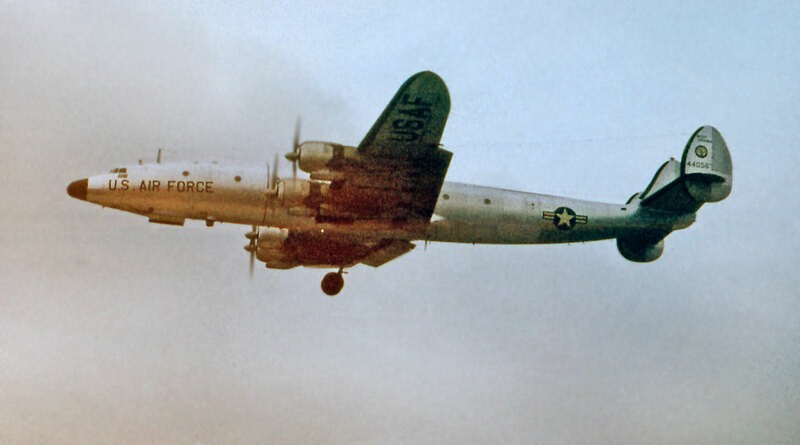 42-72760 Douglas VC-54D Skymaster (10865) USAF on 09 August 1964. 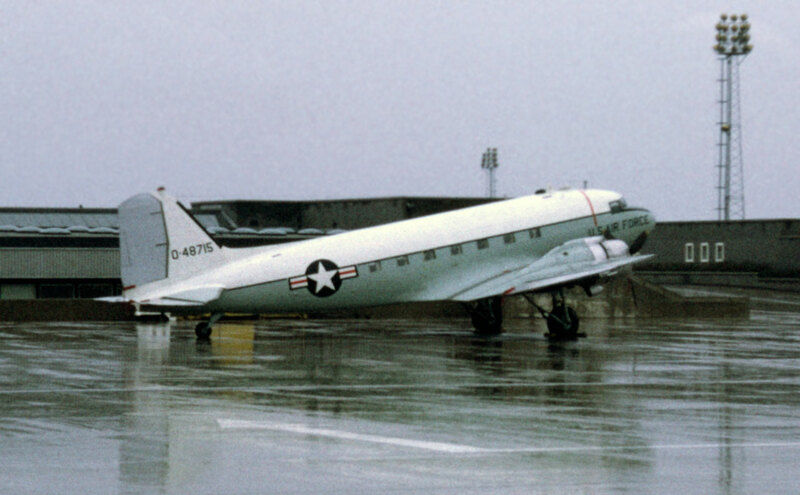 91998 Douglas R5D-5 / C-54Q Skymaster (10750) USN - Keflavik. 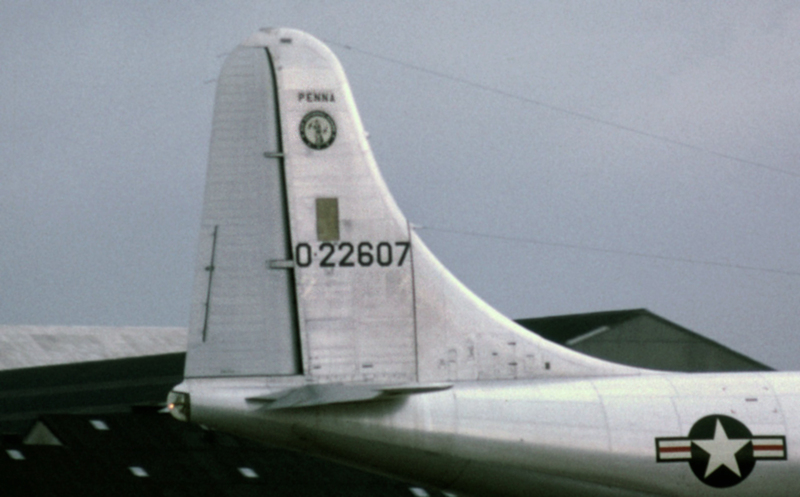 Ex 42-72645 C-54D-10-DC, later became N96449. 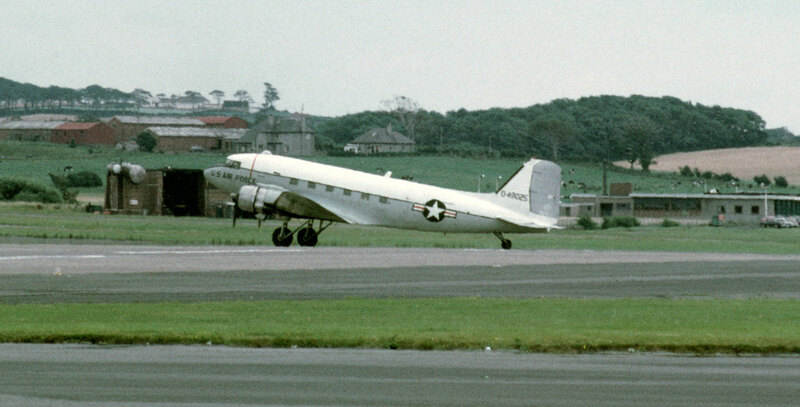 Shown here at Prestwick in May 1967. 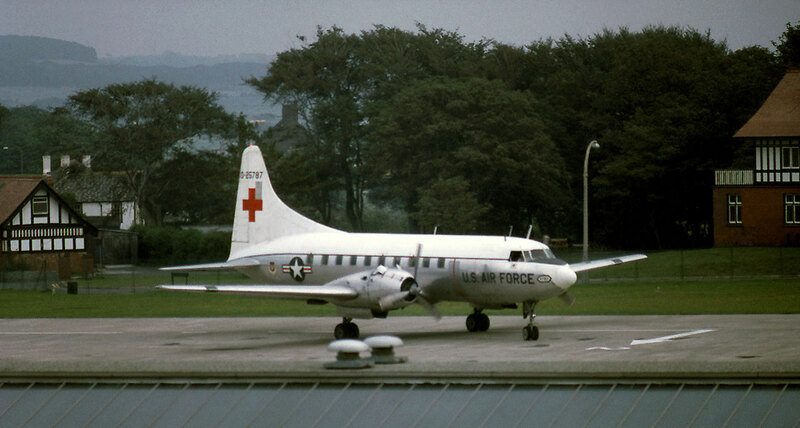 42-72464 Douglas HC-54D Skymaster (10569) USAF - Rescue, based at Prestwick with 67th ARS. In the circuit in September 1965. 42-72601 Douglas HC-54D Skymaster (10706) USAF - Rescue. 67th ARS. 42-72696 Douglas HC-54D Skymaster (10801) USAF - Rescue. 67th ARS. At USAF base Open House, September 1965. 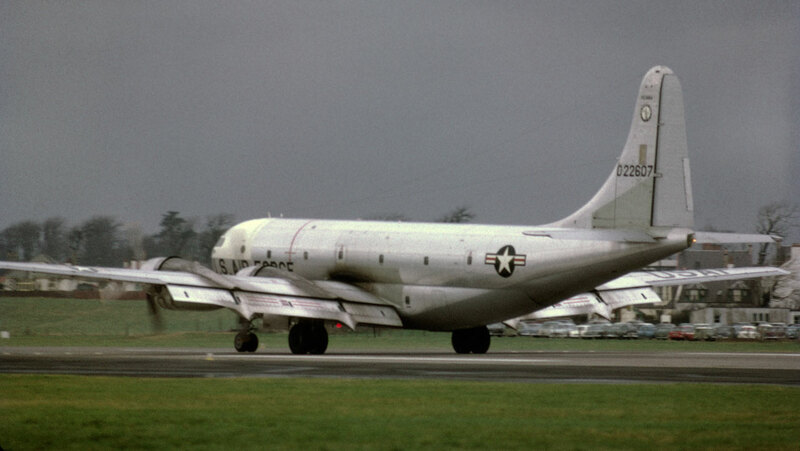 50821 Douglas C-117D Skytrooper (43322) USN - Mildenhall. 15 July 1967. 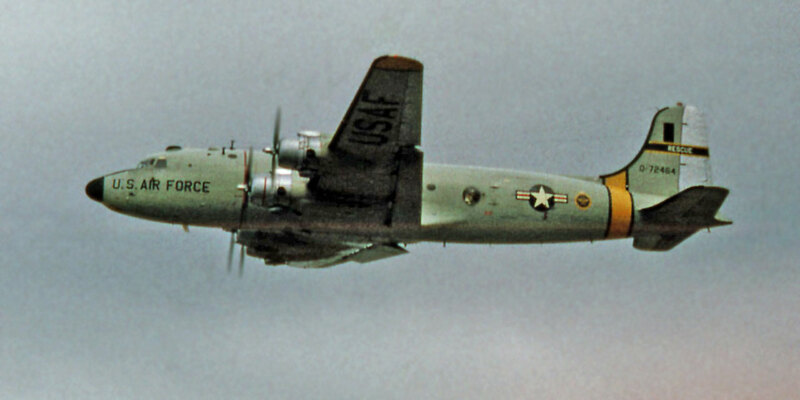 17191 Douglas C-117D Skytrooper (43379) USN on 07 August 1970. 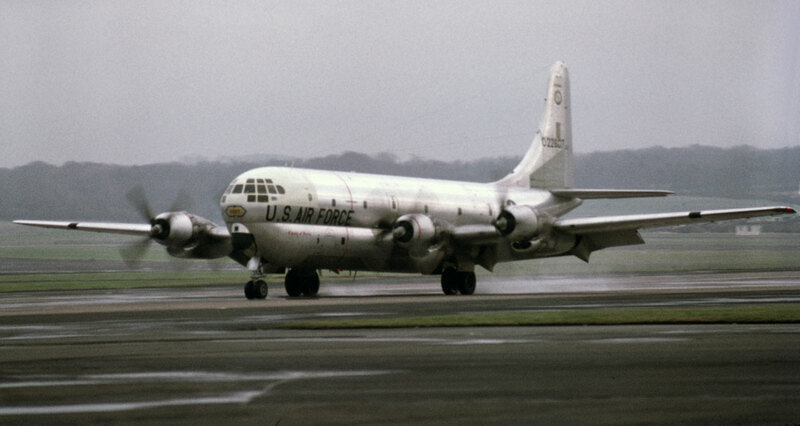 17191 Douglas C-117D Skytrooper (43379) USN on 03 January 1972. 45-940 Douglas C-47 Skytrain (16943/34202) USAF. Climbing out from Prestwick on 11 August 1968. 43-49025 Douglas C-47 Skytrain (14841/26286) USAF 20 TFW. Prestwick 11 August 1968. Later to Guatamalan Air Force as FAG550. 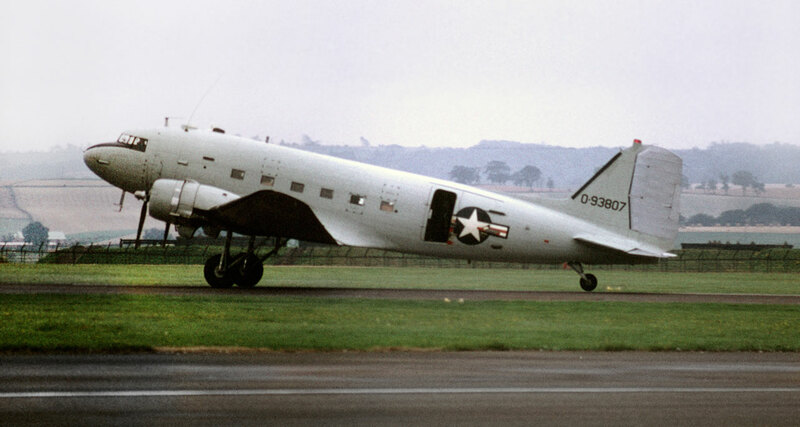 43-48715 Douglas C-47 Skytrain (14531/25976) USAF AMF Europe - 322nd Air Div TAC. At the Prestwick civil terminal, 05 May 1968. 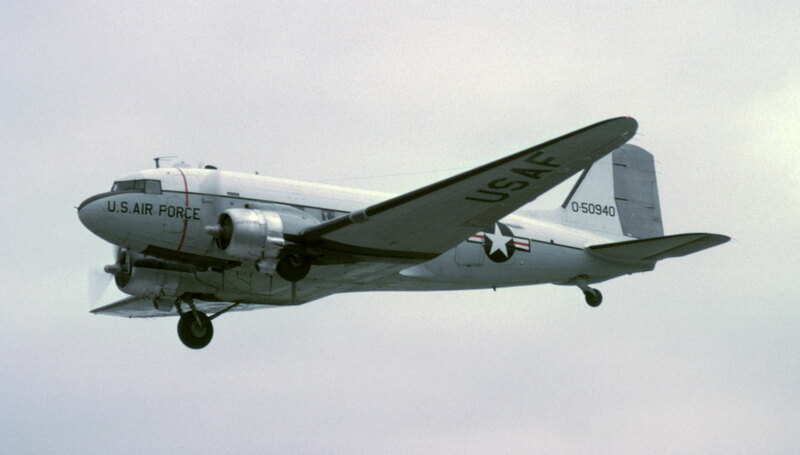 691 Douglas C-47 Skytrain (26592) USAF. 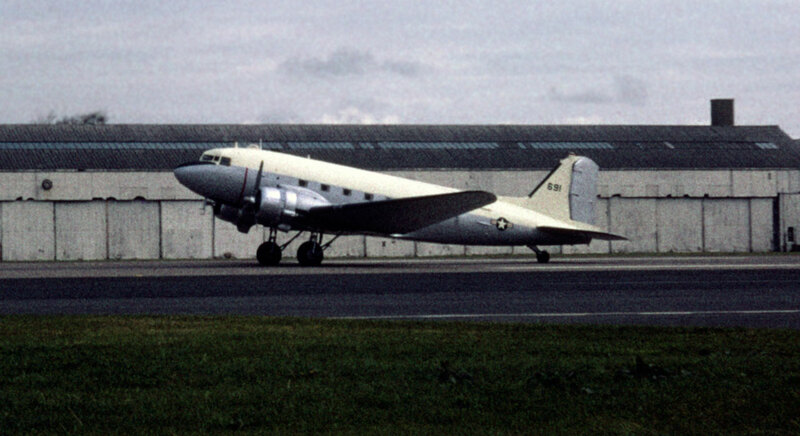 43-49691 departs Prestwick in 19 September 1965 for Royal Libyan Air Force. 127 Douglas C-47 Skytrain (34397) USAF. Not too certain that this is a Ken Marshall shot, looks like a slide Ken took of a print. 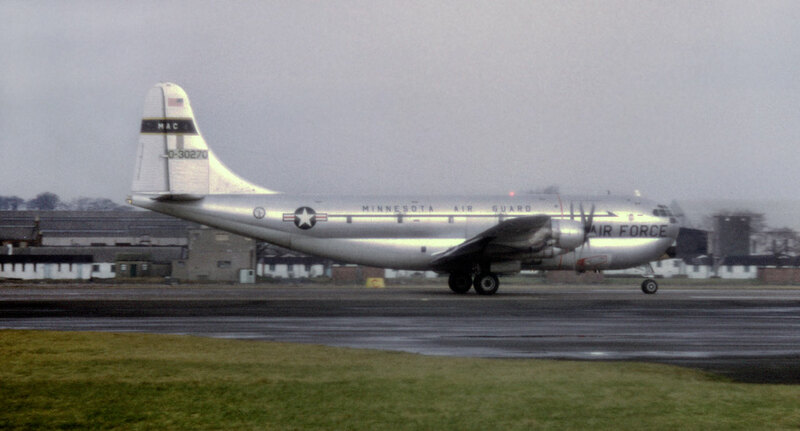 127 ex 45-1127 (canx 01 April 1963) came through Prestwick on 20 April 1963. Here it is for the record. My thanks to Tom Macfadyen for the info. 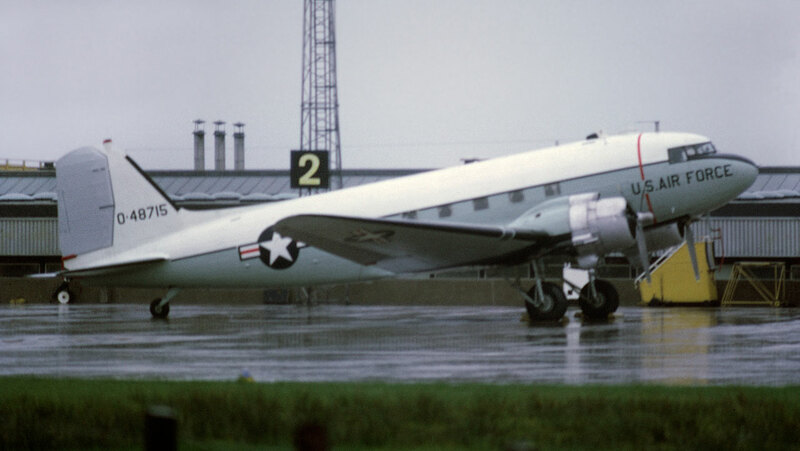 42-93807 Douglas C-47 Skytrain (13760) USAF. At RAF Leuchars, 14 September 1968. To Davis-Monthan by October 1971. 54-0661 Fairchild C-123K Provider (20110) USAF. 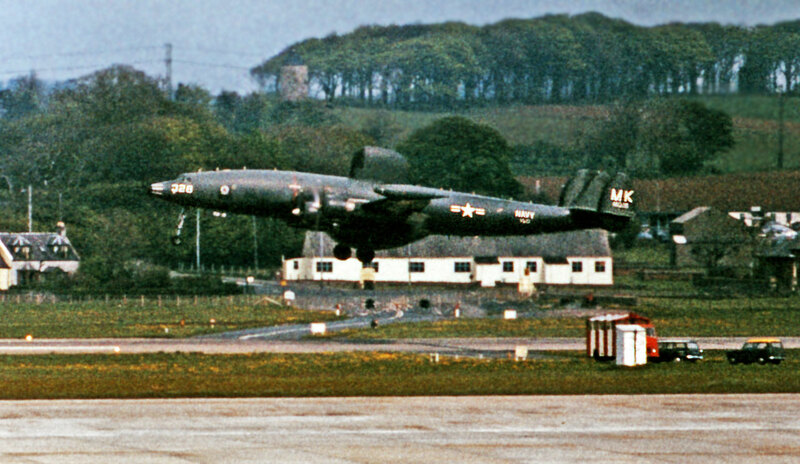 Shown here at RAF Leuchars on 11 September 1967. Later to N4112A.